are you Vivid and Brave? do you live in a way that people see you as VIVID & BRAVE? Do you have a spirit of being true to yourself that shines out in your confidence? 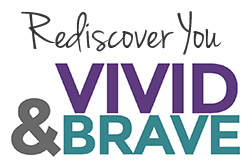 I'm participating in Vivid & Brave's coaching group to help my words flow more authentically when telling my stories. I love stories, you know. I can't help but tell the background behind a craft project or the childhood rememberence that comes up when smelling an aroma. So when Christine (with a Ch! ), a friend from many years of blogging, approached me about joining the Vivid and Brave coaching, I was excited to consider the opportunity. What does VIVID mean to me? I want to let my sparkle show. Not just the sparkles on my eyes and headbands and jewelry, but the sparkle in my eyes from happiness. The glow of my skin from being healthy. The shine of my smile while telling a joke. 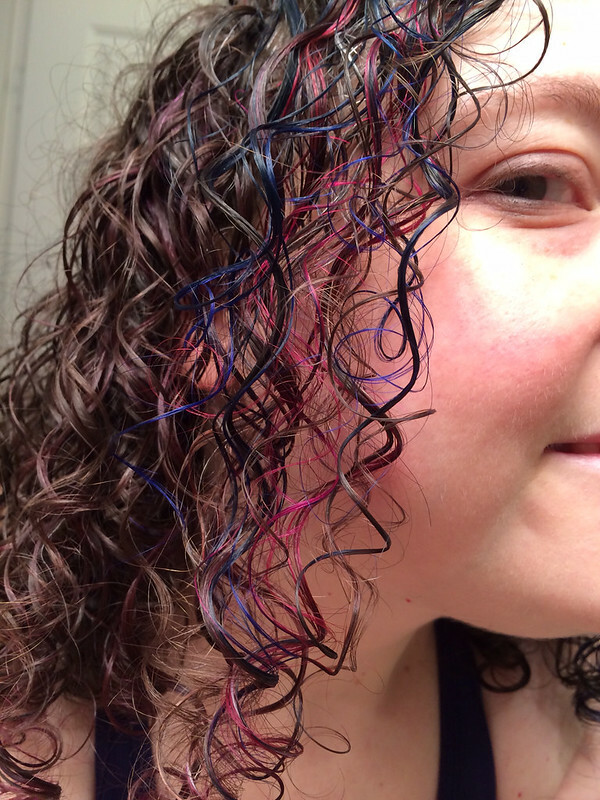 The colors that make me smile, in my clothes AND in my hair! What doss BRAVE mean to me? Standing out, not just fading into the background. Boldness in my beliefs and sharing truthful opinions. Sharing deeply with close friends. 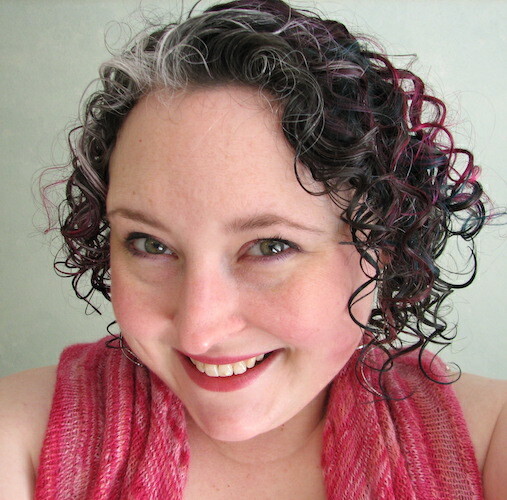 Talking about what I'm passionate about to a bigger audience, like my blog or a group of crafters. My name is Kristine, and I want to live vividly and with bravery! What do you do in your life to live with this spirit? 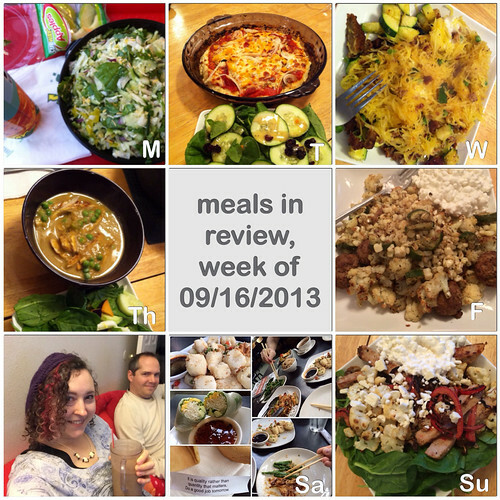 Continue reading meals in review, week of 09/30 and 10/7. Continue reading back to basics: GHG, exercise, and goal recap.. 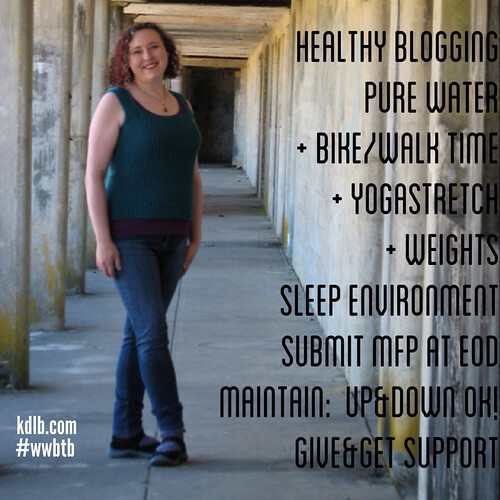 In September, I am participating in the Back to Basics challenge (#wwbtb). I started by making goals, and followed up after that with improving spaces. For this last week, the challenge was to do some tracking. Brooke introduced this tracking concept in this post. One of my initial goals for this challenge was to remember to finish out my day inside of MFP at the end of the day, because doing that last step gives me a moment pause to look over my day. I am proud to say I've been doing well on this goal, and it's also reminded me to take extra time to be more careful in planning out the following day. And this sets myself up for success! Anothing thing I've been tracking is my meal plan. I've been writing blog posts with the review of the week, and that not only is good for me to look back at, but I've also heard from friends that it inspires them too. A look at my lockscreen goals (I put this pic on the lockscreen of my phone to remind myself of what I wanted to work on this month, and it is inspiring me often!)... This last week had a few days of being really weak. This interfered with my exercise a bit. I did yoga stretching and ab work three times, weights once, walked fast once, and rode my exercise bike five times - most of the days, very slowly. It had me discouraged, because I'm at the point where I need to really kill it with exercise if I'm going to get back to an even keel with maintaining my weight. However, after 3 straight weigh-in weeks of gains, this week was down. I even made it through another scary doctor/dentist combo day! 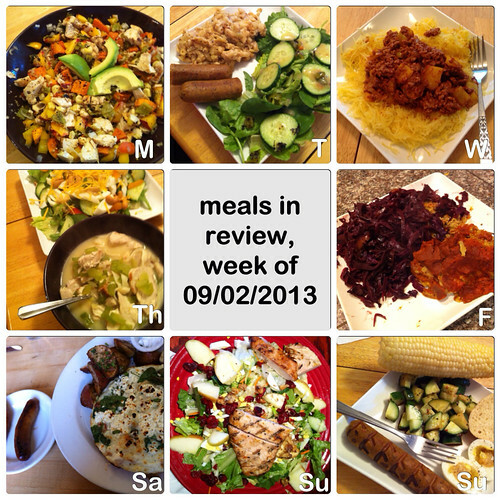 Healthy blogging and support were fine this week - I created several recipes that need to be typed up for the blog! For this coming week, I'm going to keep on with these goals, and attempt to reduce my calories by a little bit to see how that changes things. The Back to Basics challenge for the current week relates to Good Healthy Guidelines and I'm looking forward to digging more carefully at how I can integrate those tips into my life. 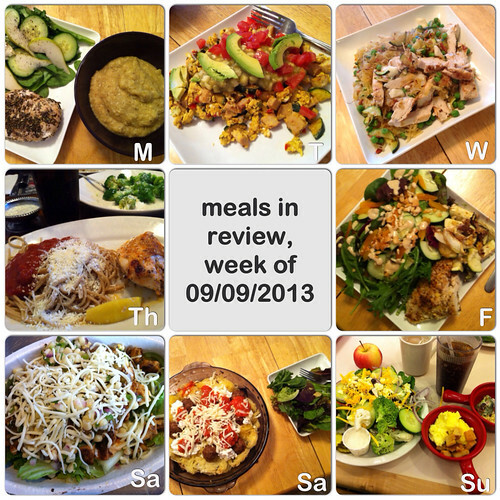 Another happy healthy week on the record books :) Did you eat anything you truly loved this week? Monday, 9/9: Roasted Parsnip soup, take 2. A nice thick lightly garlicky soup with a touch of souvenir cheese and souvenir vinegar from our trip! This needs to be written up for theredkitchen soon. Served with a salad with pear and baked lemon chicken for me, tofu for E. lunch: stovetop apple bread pudding. Tuesday, 9/10: Mexican inspired egg scramble. Included another try at homemade tomatilla salsa for a topping. used eggs from one of E's co-worker's chickens, zucchini, peppers, fennel, green onions, and turkey for me, morningstar links for E. breakfast: layered pancakes with cottage cheese, sausage links with peppers. snack: edamame. Wednesday, 9/11: Spaghetti Squash Carbonara. Used the idea of Cheesecake Factory's dish and whipped up a healthier version with grilled chicken, peas, onions, garlic, bacos, and mozzarella. Turned out pretty good! shake: pumpkin pie shake. breakfast: 10 grain cereal with pear sauce (instagram). lunch: leftover soup with chicken burger over salad. snack: popcorn, yogurt with granola and peanut butter. Thursday, 9/12: appointments OUT, Old Spaghetti Factory. Baked Chicken always sounds better than the nutritional stats show, even with things on the side and adding broccoli. It was a yummy meal, though, with a little bit of the things I wanted to really enjoy. breakfast: bananacake with sausage/peppers. Friday, 9/13: Coconut chicken with salad. This was inspired by an instagram post from rachelskeie and i added crumbled bread to my mixture. My salad was all jazzed up with cashews and apricots and cucumbers, as well as Tahini Miso dressing (the dressing part of this recipe). E had soy glazed tofu with carrots. Also, I food-prepped and cooked like mad today! lunch: roasted yam, onion, and turkey. snack: yogurt and homemade pumpkin granola (instagram). Saturday, 9/14: shopping lunch OUT, Chipotle. Salad with chicken, fajita veggies, corn salsa, green salsa, and a little cheese. Now that I know how to order here successfully, I'm a pro! and I love that their nutritional data is so easily available on their site. dinner: leftover spaghetti squash, meatballs, and salad. Sunday, 9/15: breakfast OUT, Sweet Tomatoes. Big salads, bit of potatoes and eggs, fruit, and oatmeal. All I can eat goodness! dinner: TBD. This coming week, I've got a little less inventing on the brain and giving E some of his favorite flavors from before I made over my life. And healthified versions of them for me. :) ...and that's the story! I love having a story for the things I'm wearing, especially my jewelry. 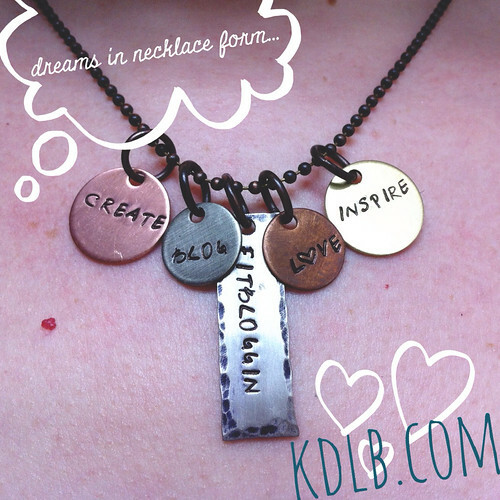 So when I saw a jewelry designer, Bama+Ry, was going to be bringing her cute charms to the fitbloggin conference I attended this summer, I was excited. I scoped out her site beforehand, and then was sure to hit her table right away at the evening event. Today was celebrated as "Discover Your Optimal Health day" by the coaching units of Take Shape For Life (the coaching side of the health plan I used to change my life). It seemed like a great day to wear my heart on my sleeve with my new charms! love - this word has been important to me all my life. family and friends are super important to me, and the word love represented that. So much so that as a child, I signed every birthday card I made with "love productions" for the card company name. And then my husband got me the domain name love-productions.com as a Christmas gift for me in 1999, and that turned into my web design company site for many years. create - what do I create? the easier question might be "what don't I create?" right now, a lot of yarn-y goodness (I'm kristine on ravelry, with my kadyellebee knitting patterns), but it also encompasses my health - I am creating health in my life, through a lot of hard work! I consider it my full time job right now, anything else is just bonus until I can get a handle on what I can do to allow me to live with fibromyalgia. inspire - going right along with the idea of creating, I want to inspire others. I want to inspire people to find a hobby that makes their heart sing. 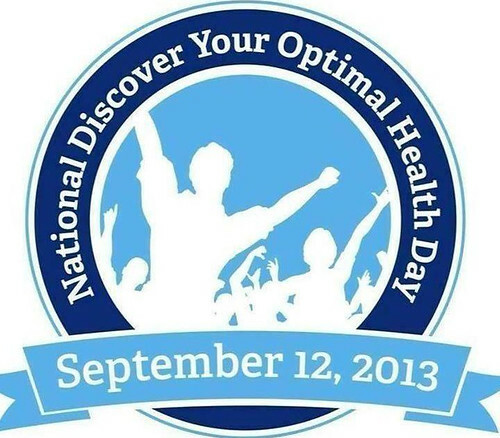 And my new discovery is that I want to inspire people to make healthy steps in their lives. I don't know what that looks like yet! 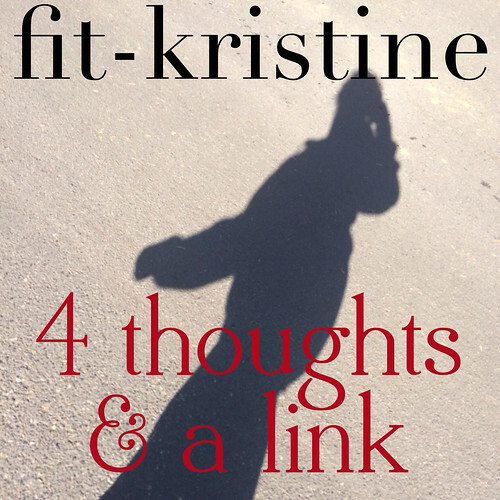 fitbloggin - the conference that really gave me the confidence to dream and believe that there is more to healthy than the physical side - emotional health is just as important. I am blessed to be surrounded by friends online that I know from the conference, and I truely believe I will look back and see this summer as a turning point. There you have it, my biggest dreams and things that have molded me into the person I am today, all encompassed on my neck today. (plus bonus little hearts on my ears!). and that's the story! 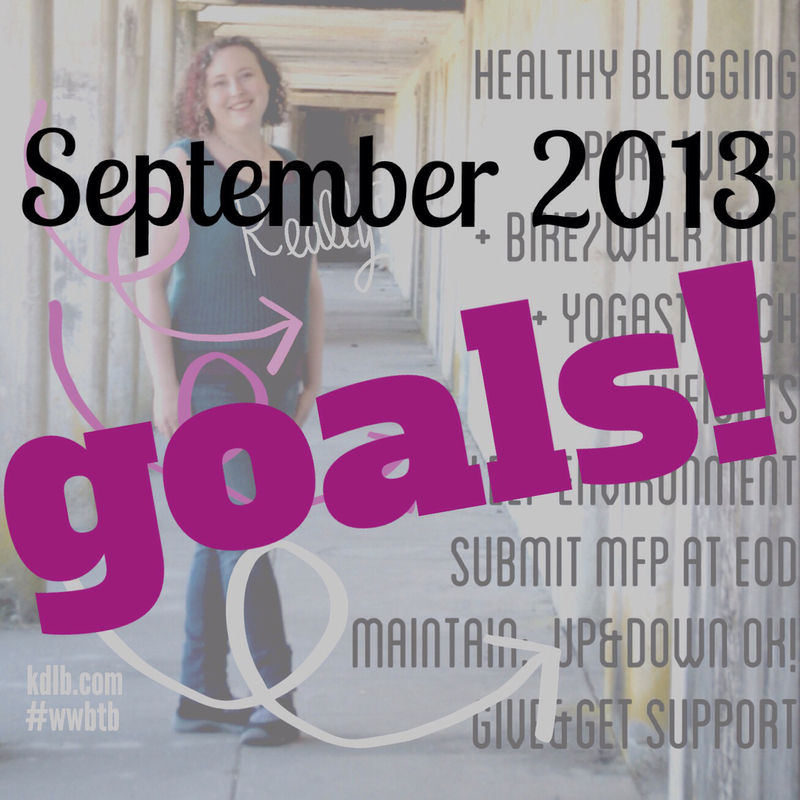 Last week, I wrote a post about the Back to Basics challenge (#wwbtb) and listed out some of my current goals. First up, the challenge for this week was Improving Spaces, making areas of my home better able to help me reach my goals. This has been a constant source of the rearrange-a-rama in my house through my journey! 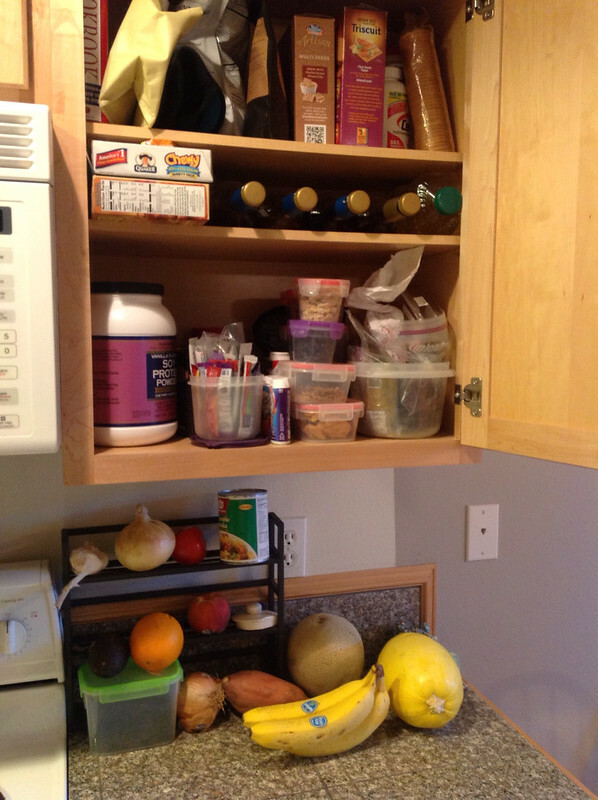 In the kitchen, I carved out spaces for my medifast meal replacements early on, and then did a major purge of the extras in the cabinets around them. 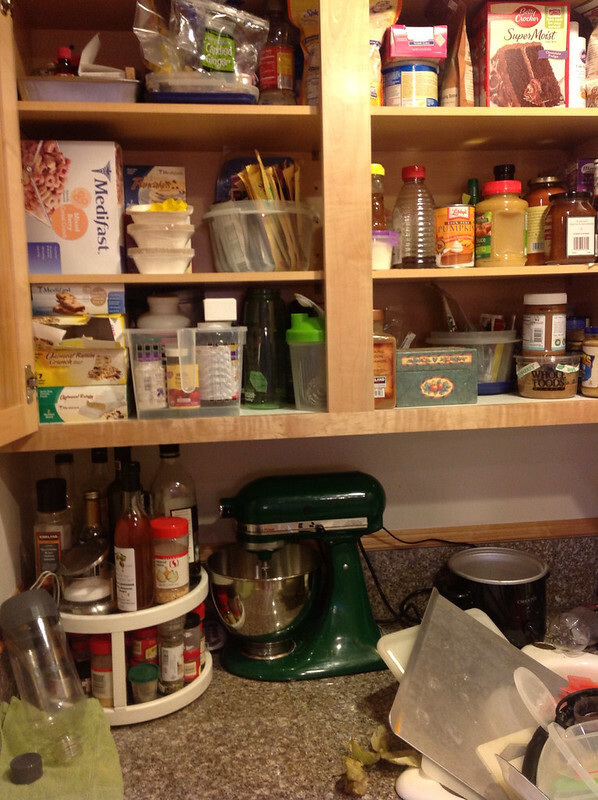 I've been tweaking these cupboards a little more as I have been adjusting to maintenance. Today, I condensed the selection of meal replacements and protein bars into one area, and moved the dried fruits and nuts and smoothie makings to another area. This gave me a little more of a consistent place to grab for the things that match. Yes, that's a big theme for me, "like" things MUST go together, even if the order seems nonsensical to those around me ;) My scale and magic bullet and George Foreman grill are easily accessible on one counter. My measuring cups and spoons are in one drawer and tea is in another. I'm pleased with this setup. Another area I made over this spring was my craftbrary/exercise area. It was bookshelves in a guest room, then my craft room, and now my exercise bike and weights are in there. This week, I've been working on straightening for not only ease of exercising but to revitalize my business goals. Because one of my new goals is to improve my sleep atmosphere, I've also been trying to keep things clean around my bed. Less clutter gives me less to stress about, theoretically. And less clutter lets me find my sports bras & yoga pants, and actually do the exercises in there! The challenge for the present week is all about tracking, and I'll look more at that soon. I'm so deep in the tracking on MyFitnessPal that every bite is documented. I don't trust my body yet to tell me when I'm hungry all the time, though I hope to get more intuitive about this! So how did I do on my lockscreen goals? I blogged several times. I drank more unflavored water every day. Exercisewise, I rocked it: 4 days on the bike, weights twice, yogastretch and abs three times. and I walked both days of the weekend! My sleep environment is still a work in process - one night, I fought the sleep and got up and played in html for several hours instead, oops. As far as weight goes, I'm up just a tiny bit, but my pants are fitting better, and I am feeling tighter and stronger. Maybe a little too worn out, but I did push myself awfully hard after being less active for a few months. So I'm pretty sure that this will all show that my muscles are forming and needed repair time before I see a balancing effect. Giving and getting support was good. I'm hoping to just continue on with all these things this week, no big change in goals. I'm feeling proud :) Rededicating my efforts really seemed to help! Getting back in the habit of writing my review of the previous week's meals :) I tried some new delicious flavors this week, made over an old favorite recipe, and ate healthy when we went out. I'm proud of myself! Monday, 9/2: Labor Day, stayed in with a cold and cooked: created a Hatch Chile salad, inspired by finding roasted hatch chiles at Whole Foods. Combined grilled chicken, quinoa, chiles, peaches, sweet potatoes and a bunch of other veggies to make something cohesive and delicious. dinner: spaghetti squash with meatballs. Tuesday, 9/3: special Maciflowercheese with sausage and salad. This was an attempt at a vegetable-filled, but still flavorful, version of one of the meals I miss cooking the most on this new healthy meal plan. Featured Vlaskaas, a creamy sweet Gouda-like cheese that we got on our Leavenworth trip, roasted cauliflower, and a light white sauce with celery. breakfast: omelet with hatch chiles. lunch: leftover barbecue tempeh. Wednesday, 9/4: early dinner for one - turkey Goulash with spaghetti squash. I attempted to find something similar to the flavor of what my mom made for us as kids (ground beef, macaroni, and tomato paste) in a healthier format with added peppers and onions. I need some good paprika, and I tried cinnamon and some nutmeg, but there's still some flavor missing that I'm not remembering! breakfast: bananacake with sausage and veggies. lunch: spinach salad with peaches, homemade tomatilla sauce, and chicken. Thursday, 9/5: Chicken Ginger noodle soup with salad. This is an invention I started doing while loosing weight to use shiritaki noodles and celery, both filling items for low carbs and calories! I jazzed the salad up with hard boiled egg whites, dried apricots, and cashews. breakfast: omelet with tomatilla sauce. lunch: leftover goulash. Friday, 9/6: early dinner for one - Turkey slowcooker meatloaf, based loosely on this Paleo recipe with Braised red cabbage, based loosely on this allrecipes recipe with mods from the comments. breakfast: banana bread oatmeal (instagram). lunch: egg scramble with tomatilla sauce. Saturday, 9/7: girls day OUT - egg-white Greek frittata with chicken sausage from Mother's in Portland with fabulous French press coffee. Had a few of the rosemary potatoes the kitchen incorrectly sent. Perfect flavors of spinach, sun-dried tomatoes, and feta combine so well here! dinner: chicken burger sautéed with cauliflower and fennel, served with cottage cheese and leftover red cabbage. snack: apple crisp with peanut butter granola topping. Sunday, 9/8: groceries day OUT - Grilled chicken apple salad from Red Robin. We got some exercise by walking there and through the mall! dinner: corn on the cob, tofurky sausage, cucumber salad, egg. snack: frozen yogurt from the mall, sweetened with stevia. Did you cook anything you absolutely loved this week? This page is an archive of recent entries in the health category. home is the next category.